I am no longer supporting this file, discussion and bug report forums have been closed. 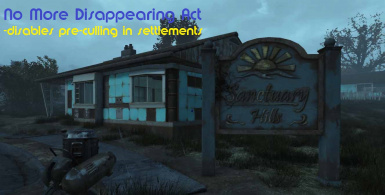 - This mod disables pre-culling in settlement cells making it possible to scrap large objects such as houses and hedges without causing the world to blink out of existence as your character passes through the area where the scrapped object once stood. Completed - (Optional) All in One Version AIO1.0.1 which includes All Vanilla Commonwealth and Far Harbor Settlements as well as the following user requested sites: Breakheart Banks, Fiddler's Green, Mystic Pines, and Revere Beach. Completed - (Optional) All in One Version AIO1.0.a which includes All Vanilla Commonwealth and Far Harbor Settlements as well as Other Locations (Revere Beach) as requested. Let me know your favorite non-vanilla settlement locations and I will add compatibility for them as well. Completed - (Optional) Far Harbor Edition - Version FH1.0.a Added Far Harbor settlements. Completed - Version CW1.0.6 Added the cells around Sanctuary Hills that contain water, by request. Completed - Version CW1.0.5 Added a cell east of Sanctuary Hills. Completed - Version CW1.0.4 Added a few more cells as requested. Completed - Version CW1.0.3 add support for a cell North of The Castle. Removes Concord (see edit below). Completed - Version CW1.0.2 adds support for Beantown Interiors in Concord, as well as some more Wilderness cells incorporated. EDIT::: The author of Beantown Interiors incorporated the fix I have employed here, so I will be removing the Concord cells from my list of those incorporated. This will further improve performance and compatibility with other mods. Completed - Version 1.0.1 adds support for a missed cell in Sanctuary and the cell at Sunshine Tidings which contains the cabin with the missing wall. Be sure to check out my other mod. MOVE OVER TRASHCAN CARLA. If you are coming back to get the latest update, please endorse my mod. It means a lot to me. Thank you for your support. 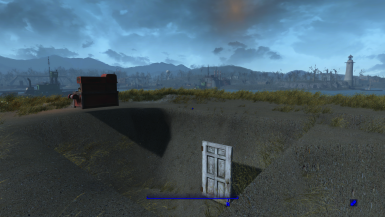 This mod disables pre-culling in settlement cells making it possible to scrap large objects such as houses and hedges without causing the world to blink out of existence as your character passes through the area where the scrapped object once stood. Areas outside of the vanilla settlements have been included for those who are using mods which create alternate settlements. Cells surrounding the settlement locations have been added to accommodate players who use mods which expand the existing settlement areas. Any mod, including this one, which makes changes to a cell or it's properties, can uncover an array of strange issues. Here are a few that you may see, and what to do about them. A bug, is an issue caused by incorrect development of a mod. Bugs can be corrected, once the mod author understands what is causing the issue. A glitch, is an issue caused by incorrect development of the game itself. Glitches cannot be corrected by the mod author and must be dealt with by work-arounds. Cell Reset -When this glitch occurs, all of the changes you have made to a cell will revert back to their original state. This in not actually a bug. It is a glitch that can be caused by removing the esp file from your load order OR by changing the name of the esp file. This is why starting a new game after installing a mod is recommended, among other reasons. All of the ALL IN ONE files for this mod are named the same, so you should not encounter this bug unless you are switching from one of the other version to the AIO version. In this case you will need to start a new game. Or, redo changes to your settlement cells. No Sprint - When this glitch occurs, you cannot sprint in a settlement. This too, is not a bug, but a glitch. 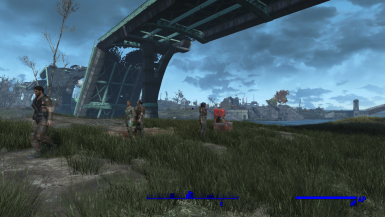 To work around this "bug", Open up your Fallout4Custom.ini and under [Gameplay] tab add fPlayerDisableSprintingLoadingCellDistance=0. Workshop Boot - When this glitch occurs, you will be kicked out of workshop mode for no apparent reason. This is not a bug or a glitch. It is a game mechanic that you will notice in the vanilla game if you walk out of the build area while in workshop mode. Specifically, this issue occurs when you move from a cell that is in the build area (or changed by a mod) to one that is not while in workshop mode. The simple solution to this is just to go back into workshop mode. I have done my best to include cells surrounding all the settlement areas, so that you will not experience this issue. But, since there are many expansion mods, I cannot accommodate all of them. If you have this issue, please make a note of your exact location relative to vanilla map locations. Post this location here, and I will do my best to modify the cells causing the issue. Power Armor Reset - When this glitch occurs, you will notice that your Power Armor has disappeared off of any frames that have been left in the cell with armor attached. The work-around for this is to either remove armor and store it in a container, or to scrap and rebuild frames that have been found in the game. There are several mods available which allow build-able power armor frames. Can't Move in Build Mode - If you find your self in this predicament, simply exit build mode, go into third person view and then re-enter build mode. The only requirement is that this mod is loaded as close as you can get it to the end of your load order. So, install normally, use LOOT, then drag this mod to the last of your load order. I am currently running my mod last of 254 mods and the game runs great. My load order works with 254 mods installed. Here are the last few lines. I also have bUseCombinedObjects = 0 and bUsePreculledObjects = 1 set in my Fallout4Custom.ini file under the [General] section and fPlayerDisableSprintingLoadingCellDistance=0 under the [Gameplay] section. This is the only configuration that I can say for sure works. I am not a developer. I just made a mod. I do no testing other than on my own PC. NO ANIMALS WERE HARMED IN THE MAKING OF THIS MOD. AREAS INCLUDED IN THE NEW AND IMPROVED UPDATED ALL-IN-ONE VERSION OF THE MOD. (TEST IT AT YOUR OWN RISK). Fifty plus Points of Interest and multiple Wilderness cells surrounding the areas listed. I'd like to thank Bethesda for the CK and all their games. I would also like to give a shout out to the mod authors of the mods that allow us to Scrap more items.